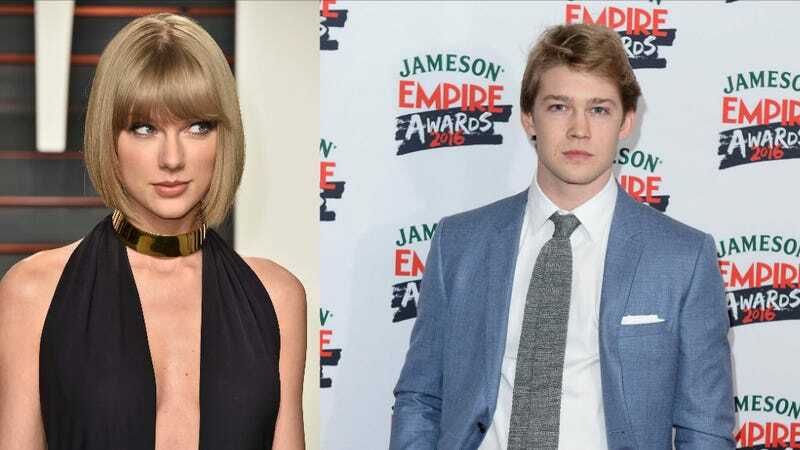 It feels like approximately 50 years ago since we first reported that Taylor Swift and Joe Alwyn were dating. Maybe you forgot about his news because you were distracted by other, more pressing matters or maybe it’s because they’re doing a very good job at keeping their blossoming love a secret. Reporting on the scant details of Swift and Alwyn’s relationship. E! News reveals not a lot of information in a whole lot of words, breaking up the text with pictures of Swift and her former paramours, including Tom Hiddleston and another man with a beard that I don’t recognize immediately but assume is Calvin Harris. That’s not what you came for, though, is it? You came for the hot and heavy details of how Taylor Swift is keeping her relationship with a nice British boy a secret. Taylor and her new boyfriend traveled together from London to New York, accompanied by her bodyguards and a lot of luggage. They both wore hoodies and scrunched down in the car as to avoid being spotted. They are “romantic friends” who are trying to get to know each other in private without external judgment. Here’s some news about another couple trying to keep their relationship private without planting like, four sources to insist that they are KEEPING it PRIVATE. Kirsten Dunst, recently engaged to Jesse Plemmons, is a baby person now. Cute. That’s cute. Also cute is this gossip bone Page Six tossed in at the end, here: ““Kirsten and her fiancé were making out” at Cannes. Nice. Update on a celebrity baby that I love.